Divine Grace A.C. Bhaktivedanta Swami Prabhupada's mission. Srila Prabhupada wanted his group of artists to flood the world with Krishna art and his books were the medium in which the artwork flourished. I had direct association with Srila Prabhupada on a number of different occasions: when I was initiated in 1971 in Los Angeles, and other occasions in New York and India. 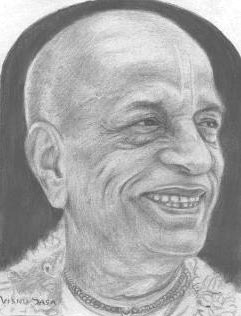 Srila Prabhupada mentioned a few times that he appreciated my artwork and one time he asked for me to come to India to paint. The first time I asked Prabhupada if I could go to India he kind of smiled and said "No, I think Baradraj and Adi Deva should go. They can learn to make dolls (dioramas)." It was then agreed that I was needed more at Tiffany St. with the other artists to help with the artwork for the Caitanya-caritamrta books. That was in I think 1973 or '74 in the Brooklyn temple, but later in 1976 Prabhupada saw my wall murals of Krishna pastimes in the Manhattan temple and he then said I must come to India. When I stayed in Vrindavan, Srila Prabhupada was there and I spoke with him a few times. I had a routine each morning to sit in front of his open window to direct guests to his room. My first day doing this I was chanting there and I nodded out because of the heat. I was awakened by Prabhupada's voice through the window when he said "There are some guests coming now, can you show them around to the door?" I was a bit embarrassed of course, and I stood up immediately noticing an Indian family of about five people approaching. I said "Yes Srila Prabhupada, uh, do you mean that door over by where Brahmananda is staying?" Prabhupada said, "Yes, that's the one, go help them. Always be ready to serve our guests." So I showed the guests the way, and Brahmananda greeted them nicely and brought them into Prabhupada's room. I could hear almost every word that was spoken in there but it was mostly Hindi which I knew very little of. But Prabhupada at first spoke in English because the man did at first. Prabhupada was such a perfect gentleman asking them questions about how the family's health was, and how the children were doing in school etc. Prabhupada was always very thoughtful and genuinely concerned about people. All the qualities of a pure devotee of Srimati Radharani were manifest in his every word, and every movement. holy name in my ear over and over again until I realize all of his teachings. It was all there in this moment, this materially short but spiritually eternal moment that would never leave my memory. That experience would stay with me forever. As I was contemplating all this, he came up and said "Now you are chanting much better." I turned around and I said with lowered eyes, "Srila Prabhupada, sometimes it's hard to focus on Krishna when chanting. The mind goes all over the place." He said, "Then focus on the sound of Krishna's name, it's not hard. Listen as I chant then get the idea." Then he continued walking back and forth chanting softly. I realized then how powerful a pure devotee's words are, and also just by hearing him chant, he was blessing me with the ability to chant. Before that I think I was pretty much like a parrot, mumbling away. Since then I've had much more respect for the mahamantra and I try to follow exactly what Prabhupada said that day. When I remember the sound of his chanting voice, I am able to focus much better on my own chanting. Only the pure devotee has the vibration that can give his student the correct chanting ability, I'm convinced of this. just do more and more... and Krishna will reward. Every temple must have Krishna art. This is best preaching." He chuckled "You have a nice service, the painting... you have no end to it." Now I think I'm finally able to understand Srila Prabhupada's words..."the painting... you have no end to it," and it sounds strange, but sometimes I feel like I could use more arms, maybe four or eight, to get all the artwork done that I would like to do to please my beloved guru, the pure devotee, saktyavesa avatar A.C. Bhaktivedanta Swami Prabhupada. Yours in the service of the Lord -- stumbling toward the Land of Krishna.